Vegetables, preferably fresh and not canned: fresh tomatoes, fresh mushrooms, fresh spinach, arugula, onions, eggplant, zucchini, broccoli, *bell pepper, hot peppers, roasted garlic, *roasted red pepper, roasted roma tomatoes, sun-dried tomatoes, artichoke hearts packed in water not oil, etc., *note: bell peppers and spinach are on the “Dirty Dozen” list, please buy organic. Meat: if you always have meat on your pizza, try leaving it off and experimenting with a variety of vegetables or use gourmet chicken sausage diced into cubes, *pork patti sausage cooked and grease drained, *pepperoni, *Canadian bacon, grass-fed, free-range, ground beef cooked and grease drained, *note: please buy pork from companies that humanly raise their pigs. WINNING COMBINATIONS: Grilled eggplant and artichoke with arugula, fresh spinach and roasted tomato with goat cheese, grilled zucchini and onion and mushroom and roasted garlic, Canadian bacon, mushrooms and grilled pineapple, be creative and try new things. DIRECTIONS: Pre-heat oven to 475 degrees or as hot as your oven will go. Process all ingredients together in a food processor or blender and mix until smooth. 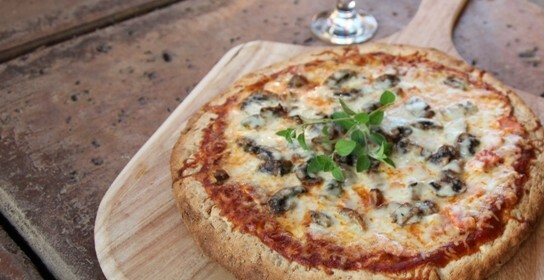 Take sprouted grain crust out of the package and place on a pizza stone or baking sheet. Spread 1/2 of the tomato mixture on the pizza, keeping the sauce about an inch away from the edges. Lay down the toppings of your choice. Add the cheese. You don’t need as much as you think, it spreads out when you bake it. Place pizza in hot oven and bake 8-12 minutes or until crust is browned and cheese is bubbly and golden. Remove from oven, cool for a few minutes. Slice pizza in half with a pizza wheel or a pair of scissors then cut each half into 3-4 equal pieces, depending on how large you want your slices to be. HEALTHY HINTS & TIME SAVING TIPS: sprouting grains unleashes their protein, making sprouted grain breads a better choice. Use the same vegetables from the pizza, in a huge salad and pair it with a no-fat dressing or make your own. Try to buy food in cartons verses cans, can linings can leech chemicals into food, especially acidic foods like tomatoes and pineapple.